Lately, J has been obsessed with everything bathtime. Bubbles and water and bath. It's all he talks about. He especially gravitates to books with bathtime featured. So what is one to do when your child is obsessed with bathtime? Well, you set up a light table invitation based on that theme, of course. Now, we don't normally get messy on the light table, but since we made the table waterproof, I decided to embrace the messiness this time. The invitation consisted of four transparent bathtub shaped containers that I found at the dollar store. I filled each bathtub with some blue water beads. I then whipped up some soap foam (Fun at Home with Kids has a wonderful post on making soap foam in case you've never tried it). I also grabbed two towels, which made for easy clean up. Besides, bathtime isn't complete without towels, right? The first thing that the boys did was dump all of the water beads into the soap foam, which felt irresistible. Even I had to dig my hands in. 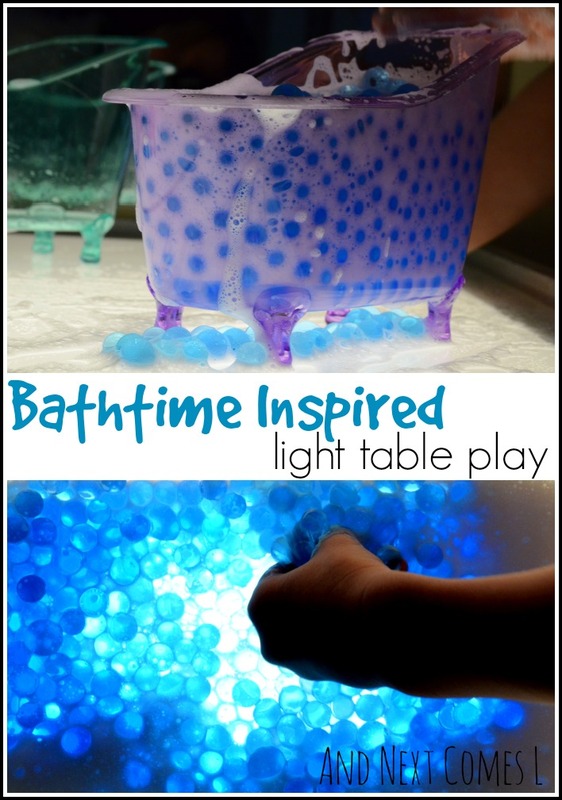 The combination of water beads and soap foam just looked so cool up close, especially with the glow of the light table. Doesn't it look like a bright, bubbly bath? Once the materials were thoroughly mixed, the boys started filling the bathtub. J hoarded most of the water beads, filling his bathtub until the bubbles started to pour over the lip of the tub. If you've ever picked up water beads before, then you know they get slippery. Well, imagine how slippery they get when they're mixed with soap foam! When the boys managed to pick the water beads up, they happily poured them from container to container. Poor K was only allowed a small portion of water beads since, as I mentioned, J was hoarding all the water beads that he could. However, that didn't deflate K's spirit to enjoy some bathtime fun. Soon soap foam was all over and just like regular bathtime, I had two kids stripping off their clothes. So pictures had to stop here. Like I said, clean up was easy since I already had two towels on hand.